Kerry Jordan toasts marshmallows on a metal telescoping marshmallow fire roaster while surrounded by family and friends in this 2015 file photo at Bear Brook Campground in Baxter State Park. 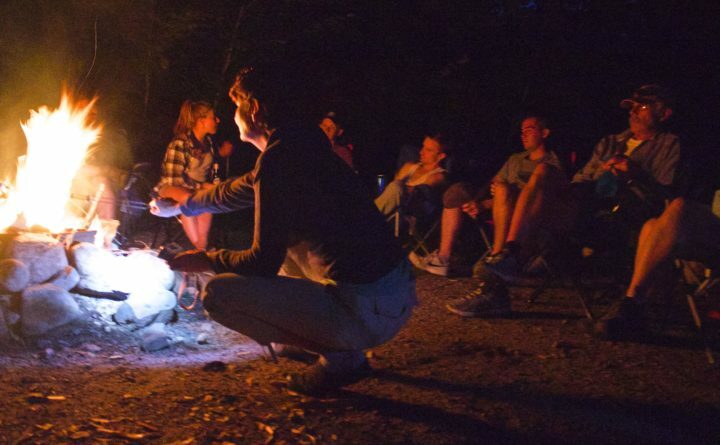 Exchanging stories around the campfire is a common example of storytelling. Sparks shoot up from the campfire, mingling with smoke to fade in the cool night air. Stars wink overhead. The flames crackle and snap. And people gather around, sharing stories, true and fictional, personal and passed down. It’s an age-old tradition, to swap tales around a fire, but did you know there are people who do this professionally, who are hired to captivate audiences with the spoken word? In Maine, expert storytellers gather on a regular basis to swap stories and share their craft with others, and the trend is growing. Phyllis Blackstone, a professional storyteller from Brunswick. A group of unruly children was what first led Blackstone, now 70, to become a storyteller. It was 1970, and she was teaching a first-grade class in Augusta. In her struggle for the young students’ attention, she discovered one thing that could transfix and engage them: a good story. As a professor at the University of Maine in Farmington, Blackstone taught storytelling to her undergraduate and graduate students. And when she retired in 2014, she became a full-time storyteller, offering programs for a variety of audiences, from children to seniors, in classrooms, community centers, churches or private settings. That’s one story. But storytellers come from many different backgrounds. Storyteller Deborah Freedman from Portland, for instance, stumbled upon the craft in the late 1980s while working on the national Names Project AIDS Memorial Quilt. A quilter, she transformed people’s stories into fabric panels for the quilt, then traveled throughout Maine for more than 10 years sharing the panels and their stories. As she learned more about the oral tradition of storytelling, she found a passion for fairytales, and more specifically, self-made fairytales. Nowadays, she specializes in taking people’s personal stories and transforming them into fairytales, a service she does for special life events such as weddings and anniversaries, and most often when people are sick. “Sometimes writing someone’s life into a fairytale can help a person who is ill get back to the essence of who they are and why they’re loved,” she explained. In 2001, Freedman was one of the founding members of MOOSE, the Maine Organization of Storytelling Enthusiasts. And since then, more groups or storytelling guilds have been established throughout the state, including WOODS — Western Order of Dedicated Storytellers — and LOONS — Lovers of Old and New Stories. These groups meet monthly to hone their craft, enjoy each other’s stories and bring new storytellers into the fold. 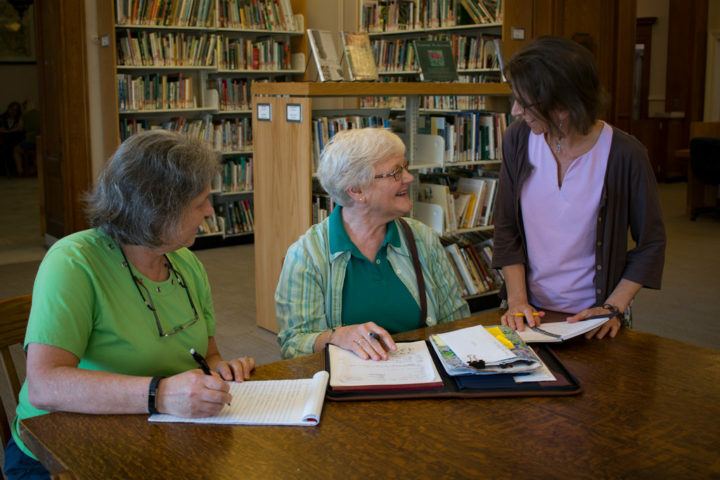 Bangor Public Library local historian librarian Betsy Paradis (from left), professional storyteller Phyllis Blackstone, and reference librarian Candis Joyce discuss a storytelling workshop. Then, five years ago, Blackstone established the annual Maine Storytelling Muster, a two-day event in central Maine that brings storytellers together from all over the state. The Moth Hour is a popular radio show that showcases storytellers around the world. Award-winning storyteller Antonio Rocha of Gray, Maine, has traveled the world since the mid 1980s performing folktales and personal stories. For children, he specializes in tales about animals because he has a unique talent for imitating animal movements and sounds. For adult crowds, he often tells stories from his childhood in Brazil, of experiences he had that might resonate with a more mature audience. Each time he performs, he takes into account who is listening first and foremost. Rocha graduated from the University of Southern Maine with a bachelor’s degree in theater and has studied the art of mime with two masters in the discipline. His style is dynamic, filled with movement and expression. Other storytellers, such as Freedman, take a very different approach, using only words to paint their scenes. Then there are storytellers who dance, use puppets or produce a unique voice for each character. Each storyteller has a style and types of stories they prefer telling, from fables to murder mysteries. But setting aside all those differences, good stories all have certain things in common, Rocha said. Folktales, for example, often center on a universal truth, something that people of all cultures can understand. An example of this is Aesop’s Fables, fictitious tales originating from ancient Greece and were initially passed down orally for many years before written down. Played out by talking animals, these fables — such as “The Hare & The Tortoise — offered lessons that could be applied to the lives of anyone. “Those stories get to travel and live for hundreds of years,” Rocha said. Often storytellers will take old folktales and breathe them new life rather than craft new stories from the ground up. This is a completely acceptable practice, though expert storytellers will warn people not to try to memorize a story word for word. Blackstone agrees. While she memorizes certain sentences in her stories, she never memorizes an entire tale. She does practice it, though. Over and over again. Differentiating it from traditional theater performance, storytelling usually involves interaction with the audience, Blackstone said. If listeners look confused, she offers explanation. If they laugh, she draws out a funny scene. This type of improvisation is key, she said. But it’s important not to stay too far from the main path. Each story needs to start with a hook, build to a climax, and wrap up with a solid ending, she said. A crowd gathers for a recent story slam event at West Market Square Artisan Coffeehouse in Bangor. 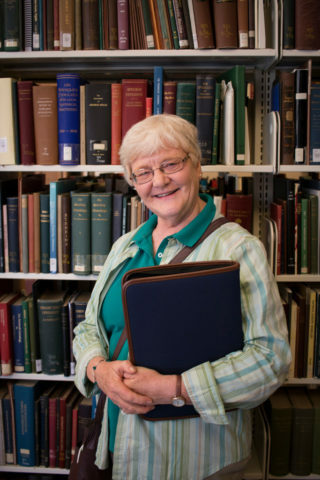 This summer, in an effort to share this traditional skill with others, Blackstone will be leading a storytelling workshop at the Bangor Public Library on Friday, Aug. 10, and another workshop at the Curtis Memorial Library in Brunswick on Saturday, Aug. 4. Both will run from 10 a.m. to 3 p.m. and include storytelling instruction, exercises and demonstrations, sponsored by Coffee by Design. This year’s Maine Storytelling Muster, which is open to the public, is scheduled for 7 to 9 p.m. on Friday, Sept. 14 and 10 a.m. to 4:30 p.m. on Saturday, Sept. 15, at the United Methodist Church on Pleasant Street in Waterville. And on a smaller scale, more informal storytelling events such as “story slams” are popping up at libraries and cafes throughout the state. Jesup Memorial Library hosts a story slam at 7 p.m. on the third Friday of every other month. 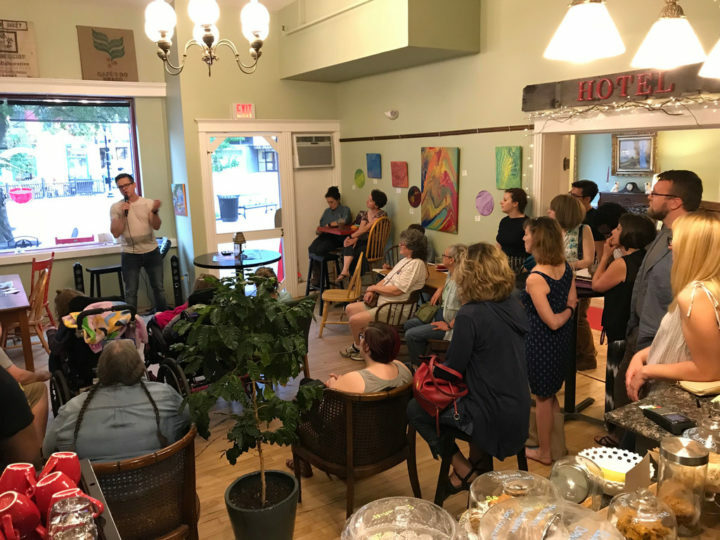 And West Market Square Artisan Coffeehouse in Bangor recently started hosting monthly story slams at 6:30 p.m. on the first Friday of every month. “We pick two or three judges from the audience willing to judge [the stories] on content, general presentation and what kind of emotion it evokes from the audience,” said the coffee house’s owner Cheryl Michaud, who said she got the idea from listening to The Moth Hour. The next story slam at the coffee house, scheduled for July 6, will be themed “In the Kitchen.” Storytellers each get five minutes to speak, and the winner will receive a $25 Buoy Local Card for shopping at local businesses — as well as bragging rights for being the best storyteller in Queen City.